It is absolutely essential that you create an effective web traffic strategy that funnels in consumers from the very beginning Launching a startup comes with a long list of challenges and obstacles. Finances and resources are often tight and there simply aren’t enough hours in the day to accomplish everything that needs to be done. […] The post How to rev up & ramp up the traffic at your startup’s site appeared first on e27. Launching a startup comes with a long list of challenges and obstacles. Finances and resources are often tight and there simply aren’t enough hours in the day to accomplish everything that needs to be done. However, none of these issues can be solved unless the business is bringing in enough revenue to fund new ideas and hire more employees to get the work done. One of the biggest startup mistakes that many entrepreneurs are guilty of is assuming that their web traffic will naturally increase over time. According to statistical analysis, the leading cause of startup failure is incompetence and the inability to correctly implement essential strategies that support a growing business. This is why it is so important that your startup has a concrete plan in place to support web traffic. While some customers may come across your website through organic search, you cannot rely on this small segment to support your startup. Let’s discuss four smart strategies startups can use to begin increasing those traffic numbers. 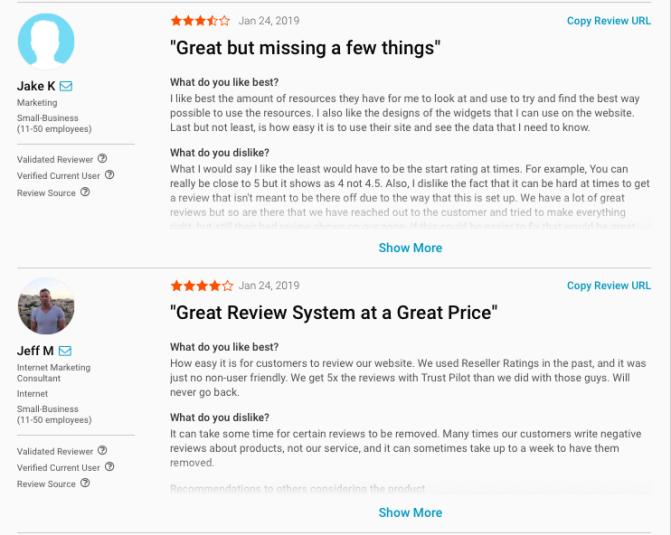 Customer reviews are not just a good sales tool to build confidence with customers; they can actually have a significant impact on your site’s searchability and keyword optimisation. According to recent research from Moz, the presence and quantity of customer reviews make up over 15 per cent of the ranking signals that Google uses to determine SERP ranking. Customer reviews are often rich in long-tail keywords that are going to be commonly searched by customers. Most search queries include descriptive words that are also used by customers to describe their experiences. For example, a common search may include phrases like, “best deal” or “cheapest option” or “high quality, low price.” Customer reviews tend to contain phrases like these, which can help to boost your site’s ranking by matching up to query keywords. Listing reviews on your own website are clearly important, but it’s also smart to include customer reviews on third-party sites as well. For example, the reviews of Trustpilot are published on additional third-party sites to increase the brand’s searchability. Each third-party site also includes links directly to Trustpilot’s homepage to help drive in additional traffic, specifically from comparison shoppers who are weighing their options with competing products. 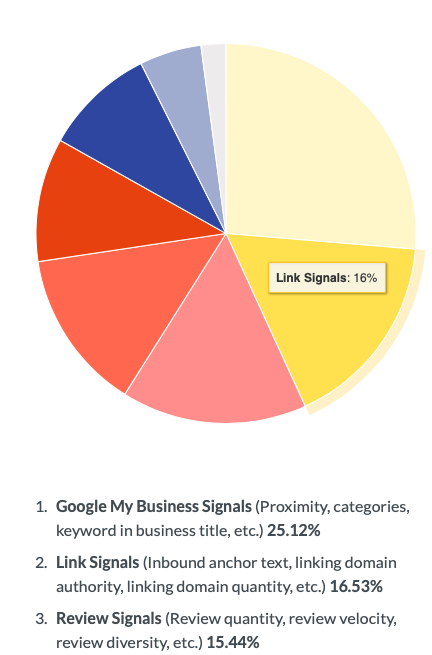 According to the previously mentioned Moz studyLink, signals made up the second largest portion of Google ranking signals — which is why it is so critical for startups to get their name and links published on multiple sites. Google also bases some of the credibility of your website on the number of external links, particularly if they are coming from high-ranking sites, so getting product features on websites or writing content for other blogs can drive traffic and improve rankings. However, it is imperative to address the importance of link relevancy. Gaining high-quality backlinks from sites closely related to your content needs to be a top focus. The days of “All links are good links” are well behind us, so just scattering links across the internet and seeing what sticks is simply not a smart strategy. First and foremost, it is important that your startup is able to clearly define the brand and its target audience. What are the key areas of focus, what industry(s) are you speaking directly to, and what types of customers are interested in what your business has to offer? From there, you can start to seek out other websites that speak to your audience and whose content is also in alignment with your brand. Be sure that you are in-the-know with your brand mentions and links within these sites to ensure that they are natural and effective, not overly promotional. Many startups make social media a key component of their marketing strategy, and wisely so. However, there’s more to it than just consistent posting. Be sure that you are also following accounts that hit your target audience, such as the right influencers, related products, and blogs/accounts that are followed by your targeted audience. This will help to establish brand associations that will lead to curiosity from other consumers to check out your brand’s account. Of course, brand awareness can also be grown organically by generating content based on your customers. User Generated Content (UGC) is highly influential and engaging because it is unfiltered and authentic. 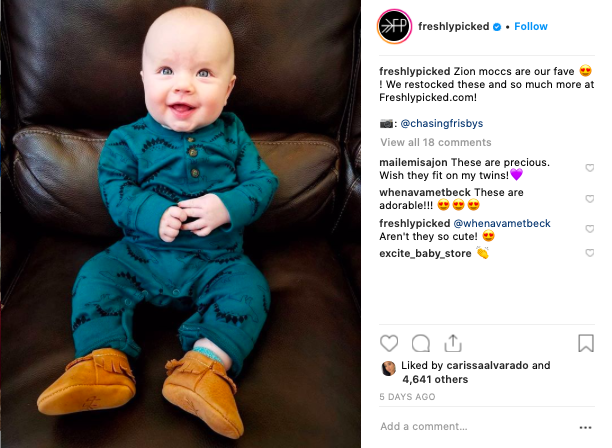 When the baby fashion brand Freshly Picked was just a new startup, it kept its focus on building trust with their customers (primarily new moms) by sharing customer stories from the very beginning. Nearly half of their Instagram posts are pictures shared by customers through branded hashtags. 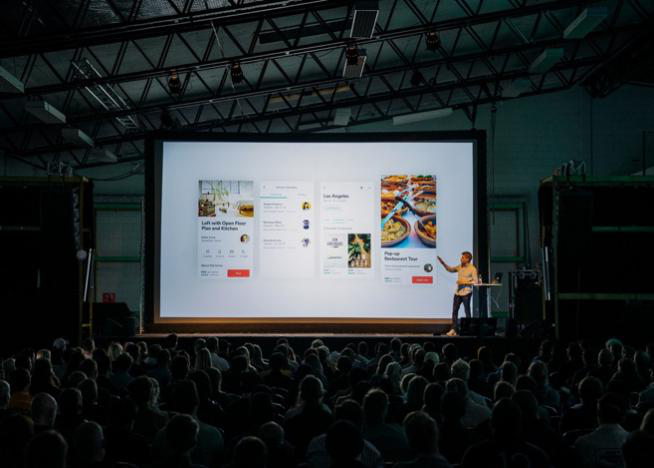 This is a great way to establish meaningful connections with your current audience and connect the brand with new audiences through meaningful and shareable content. Putting your brand’s name or CEO’s name out there as a thought leader or expert in the field can build brand recognition, which will lead to more interest in your startup/website. This is done through smart personal branding, which can be established through methods like featured interviews on industry podcasts, writing e-books and selling online courses, participating in webinars or conferences as a speaker, and so on. As a startup leader, it is important that you are getting validation from industry experts. Having credible people or organisations recognise your expertise in the field can do wonders for your brand’s reputation. It can also impact your startup’s E-A-T score, a subject to one of Google’s recent algorithm changes to help determine a site’s content quality and relevancy. By getting other high-authority figures to vouch for your brand, it can influence this score and boost your site’s ranking on the SERPs. A strong, steady stream of website traffic is something that must be built over time. There is no magical formula that can guarantee instant results, but these strategies that have an influence on ranking factors with Google and establishing brand recognition can certainly help to lay the foundation. Be sure that you take this goal to heart from the very beginning and stay focused on attracting customers through meaningful content, strategic placement, and trustworthy influence in the industry. The post How to rev up & ramp up the traffic at your startup’s site appeared first on e27.